Over the years we’ve attended many Contact Centre conferences but have never had the confidence to become an exhibitor. We always thought the products and services Circle offer would be difficult to discuss and demonstrate in the short time somebody may stop by our exhibition booth. We wanted to move beyond the normal vendor-specific conferences that we attend and introduce ourselves to people and organisations that may not of heard of Circle. The Contact Centre Institute of New Zealand (CCiNZ) was established?to fill the need for a transparent and coordinated national body to support, educate and engage professionals in the New Zealand Contact Centre Industry. 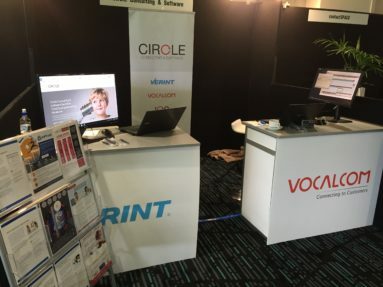 The annual CCiNZ conference seemed to be an ideal place to meet other Contact Centre professionals from a range of organisations that may not know of Circle. We took a leap of faith and signed-up to be an exhibitor at the CCiNZ conference in Auckland on 11 August. Our exhibition booth was more successful than we could have hoped for. The conference was well attended and Tony and Matt were kept busy providing introductory demo’s of the Vocalcom cloud Contact Centre solution Circle implements and supports, the Verint Workforce Optimisation product range and the other products and services Circle provides. We began many worthwhile conversations which we look forward to continuing in the coming weeks. Thanks to all who stopped by for a chat.